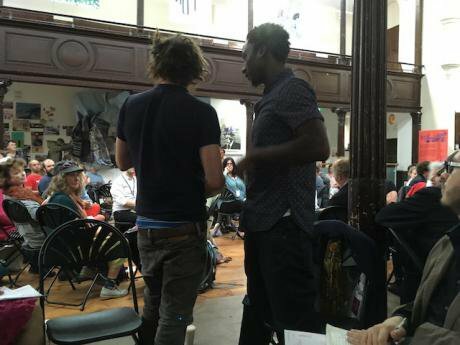 Ashish Ghadiali, Barby Asante, Ken Loach, Lowkey and Rhiannon White in The World Transformed ( TWT) session on the role of the political artist in September, 2017. TWT. Ashish Ghadiali, first interviewed on openDemocracy in 2016 during the launch tour of his film, The Confession, was one of 30 participants from Europe and beyond who took part in the Team Syntegrity – or non-hierarchical conference – held in Barcelona on 18-22 June 2017. This is one of a series of follow-up conversations on that event's themes, recommendations and relationships. Rosemary: So what are you working on now? Ash: A lot of screenwriting mainly. I’ve been part of a team of writers developing an eight-part drama with Riz Ahmed for the BBC. It’s about a British-Pakistani family from the late 70s to the present day. Riz has been working on it for years, and he’s put together an amazing team of emerging British Asian writers to support him. It’s amazing to be part of that team. R: So you are back at work with the BBC? Ash: Yes. To my surprise. Making The Confession, in 2016, about Moazzam Begg was a risk for the BBC, and it wasn’t the easiest ride for me personally. The diversity agenda and the role of being a minority artist or storyteller in Britain or anywhere is a complicated thing to navigate. But I thought it was important to make that film with the BBC, to bring that conversation into the mainstream. In terms of diversity – and I’m not the biggest fan of that word, but it’s the word they use – in the media, there has been a lot of movement in the past couple of years. I don’t know if The Confession came about because of that movement – but we certainly got funding at various stages because the film made a strong case for the points of view we were representing. In that interview that you and I did for openDemocracy, and in other interviews I did at the time on The Confession, we discussed how my own intervention was consciously in response to the bludgeoning of multiculturalism as a concept, first towards the end of the New Labour era then even more so under David Cameron. Interestingly, at the same time, I was aware that people like Riz Ahmed were making very similar interventions on exactly the same point. Work I have been commissioned to do by the BBC in the last year has derived largely from a couple of speeches in the House of Commons, one by Idris Elba and one by Riz Ahmed, both facilitated by Oona King. Respectively, they both put forward the case for diversity in broadcasting and in culture more generally, as a key space for the representation of all experiences. Both those speeches were picked up by the BBC, who then gave Idris and Riz opportunities to do something that wouldn’t ordinarily get done. Idris was given a week to curate BBC3. Riz is embarking on this very ambitious drama series. Both of these initiatives are out of the ordinary. I’ve been fortunate to be invited to participate in both. R: Let’s go back to your experience of the Team Syntegrity week in Barcelona last June. Ash: Sure. For me what was striking about the group of people you and Alex had brought together [to address the role of civil society in a time of global crisis] was how many of them were very aware of not knowing why they were there. Some of course did know why. They knew they belonged among the invited. But others didn’t and knowing you a little bit, I imagine that you made a conscious decision to bring a group of artists into that conversation. I suppose I saw myself as allied to both sides of that divide if I can call it that, in that I am an associate of Compass, an editor of Red Pepper, I do have a more obviously political role, but I am also an artist, a film-maker. So that was my experience of it, but looking around the room, that same experience led other people to feel intimidated, wondering even more why they were there, what it had to do with them, and what they could contribute. Because if you could be very fast and very fluent with the ideas, you might be able to keep up with it. But everyone was going to be pushed to their limit and beyond it. What I then noticed was that the process of requiring people to come back to the same table and the same conversation meant that each time you came back, each day you came back, you were forced to forget about the ideas that seemed so important in your head and actually find ways to keep the conversation running amongst the people there. Even more important was the presence in the room of people who would say, “Well you know, I’m no expert in this, but until it is meaningful for me, I won’t really be participating in that conversation.” Artists do that. The way an artist thinks is just very different from the way a policy-maker thinks. An artist tends to think with their whole being, I believe, and until they’ve “got it”, they can’t do anything with it. So there were different synergies with different people. R: Did you talk to Marley at the event, who is a senior research fellow at the Institute for Public Policy Research, for example? Ash: We were on the plane together coming back and I gave him a lift to London actually. The conversation we ended up having was a more local one about the UK Labour Party. He’s been a member for a lot longer than I have and for people like Marley, who positions himself, as far as I understand, as a centrist, this moment of Corbyn can seem incompetent and threatening. But then we meet on a personal level and talk. He’s a bit younger than me. I believe it’s our generation that is speaking right now, so when we talk, the connection between us turns out to be a clarifying one on both sides. R: We recorded one interview with you and Aya after the opening sessions of “Parenting the Planet” and you were quite clear there about the need to “unite the head and the heart” if we really wanted to move things forward. Would it be fair to say that? Ash: I asked Aya to come with me for that video conversation so that it could be a continuation of what had been quite a sparky process going on in those opening sessions of “Parenting the Planet”. On Day One, Richard had come through with what I now see, though I’d never met him before, was probably a pure Richard Bartlett move. We were in Barcelona and I was very interested in learning more about the whole area of “the feminisation of politics”, inspired by Ada Colau’s leadership in that city. But there was a second theme that had been combined with the first in the evolution of this group, around the military industrial complex, and I think it was me who proposed putting these together. That seemed like fertile territory. I was thinking about the Hillary Clinton campaign and the idea of the glass ceiling; but also the hawkishness of Clinton’s politics and the impossibility, as far as I was concerned, of seeing any kind of feminist emancipation in the bombing of Libya. That was where I thought the conversation was heading and then Richard stopped the conversation dead and started talking about his blue finger nails and how he wanted everyone in the group to start sharing their feelings. He wanted to know how we as individual men had encountered patriarchy in our own lives. At the time I didn’t really know what he wanted and was left a bit perplexed, but curious. In that first meeting, I encouraged him to tell us more, so that we could respond. But at the same time, there was this voice from observers in the room commenting that it was ridiculous from the outset that the group was made up of four men, chosen by the computer programme, to have this conversation about feminism. In the second session, Richard’s heartfelt account of his own experience of the difficulties he had in forming meaningful male relationships, were met by responses from Aya and Kate Farrell that were not, I felt, really from their own experience. Their responses were expert-driven. They brought up issues like women’s rights in Saudi Arabia. I found their interventions frustrating. I expressed that frustration. Because if you take gender out of the equation, what had occurred was that someone had spoken honestly, from their heart, and wanted to get things into a space that was less heady and more felt, and the response from people who wanted to express their opinions, had been to railroad them. It seemed to me at the time that this is in many ways what we are struggling against. Ash: I find it very difficult to divide or compartmentalise myself. I think that’s probably the reason why I do the kinds of things that I do. That was one reason why it used to be impossible for me to engage in mainstream politics. At university, that whole thing about joining a political party and having to then step into a game whose rules I didn’t want to learn, was off-putting. I haven’t really worked my way up through any industry or hierarchy. I’ve never really given time to learning someone else’s rules. The politics I have developed has been developed with the idea of an autonomous individual as a given. What is interesting about the present moment is that space seems to be opening up for people like me, so that I find myself able to go to political meetings and feel quite comfortable because there are many people who seem to have similar inabilities to take on conventions as their own, to divide themselves. Probably, that’s where most people in my generation live, actually. In our first interview we talked about the politics of what I was doing as a film-maker. There was politics in my choosing to live in Jenin refugee camp and set up a film unit there. There was politics in deciding not to work in TV and go instead to live in India or Palestine. The question now is over structures, inclusive structures. Certainly for the UK Labour Party, the crisis of our times is over inclusion, right? That was the great flaw in New Labour. They could win election after election, but they could only do that whilst presiding over a massive decrease in voter turnout. It was only when that turned into – “Well now you have lost Scotland, and now you are losing your support base in the north of England” – that this system of exclusion was exposed as not a winning formula after all, but something deeply destructive. The political response to neoliberalism has to find a way of including those diverse constituencies: those who have lost touch with the political structures. I think people naturally want to be autonomous. I think the political structures that properly reflect this have yet to be invented. R: What was your experience in organising sessions for “The World Transformed” (TWT), the festival of ideas and debate accompanying the UK Labour Party conference in September in Brighton? And how was it influenced by this Team Syntegrity? Ash: I spoke a lot with Emma, with Birgitta, with Richard, during that Team Syntegrity week in June, and during the same week I was getting e-mails asking if I would be interested in organising some sessions on culture and cultural policy for TWT. That was definitely an interesting confluence. When you and I first talked, last year, I was just getting on with my film-making. While I was on tour with The Confession, I was meeting Momentum groups with a view to developing something cultural. But I only really got more engaged around the time of Jeremy Corbyn’s second leadership campaign. So dipping my toe in this kind of party-based politics is, for me, as it is for many people at the present time, very new. When we went out to Barcelona I had just done my first issue of Red Pepper as its Race Editor, which I had been since January. June, post-election, though, was a moment when I felt like I was being invited to make a certain kind of new political commitment. I was chatting to Birgitta about how they were doing crowdsourced policy-making in Iceland’s Pirate Party. And so I wrote up notes on that, that week, as the beginning of a methodology. I was thinking that we might start up something similar through a series of consultations. At the same time I was talking to Emma a lot about the experience of 15M, the social movement, the influence of these movements and their relationship with Barcelona en Comu. They coalesced in my mind as something I could take straight back to a discussion about process within TWT. TWT’s process at that time was also a work-in-progress. There were thoughts about how it should perhaps be more focused on arts and culture than the year before; or that policy and the manifesto were something we might begin to take on. So the document I drafted came in useful at those meetings where we were trying to start a conversation around a participatory cultural policy event. Over that summer, what was driving us was the idea that there was an inherited notion of arts and culture which might as well go back to the feudal court, where the artist is patronised by the court and civilises us from the top down. That really needs to be pulled apart. In its stead, what we were looking for was a notion of culture that took in but went beyond Jenny Lee and the Arts Council tradition that has defined Labour Party policy since the Second World War. The logic of that tradition, it seems to me, is art for everyone, admittedly, but the art it’s talking about is still that received idea of art from above – high culture. What I kept hearing, as I talked to more and more people over the summer – was the possibility of a more radical definition of culture, rooted in the writing of Raymond Williams, Stuart Hall and other thinkers of the New Left. That idea is that culture is something we all do. We all create. Only a policy built to reflect that fact can challenge the systemic inequality of the funding systems that we now have. What we were trying to engage with in the session you attended at TWT was how we begin to shift that received idea of culture away from one that is the first thing to be cut when times are hard, because it is a non-essential luxury, to one that understands that culture is the thing we all do all the time everywhere in order to make our lives meaningful. How can we begin to facilitate that conversation? The World Transformed: Drawing on the traditions of Jennie Lee, Raymond Williams, those who see culture as a basic human aspiration, this session re-launched Arts For Labour as a participatory rethink of what culture is. TWT. R. Let’s linger on that very vibrant TWT session for a moment – thanks for inviting me! – because it seemed to me that there were two things going on and maybe a paradox in the format. We had a series of good speakers, policy experts who were tracing the history of the Labour Party’s arts policy and its evolving impact and its values. Then there was a gulf in time represented by the rise of Thatcher and neoliberalism and its grip on both policy and values. Meanwhile your audience came from either side of this gulf. There were the older people like myself who could remember the histories and some who had been involved in them, and the younger people who had never lived under that system. Inevitably, there was a judder between these two things – apart from anything else there simply wasn’t time for both. But there always is a judder in this transitional period we are now living in. You could say it is between the vertical and the horizontal. The minute you set up a panel of speakers, a top table so to speak, you have a “we” who are doing the right thing on behalf of everyone else, and the everyone else who they are trying to get to do the right thing for themselves. I think one compelling aspect of Team Syntegrity is that radical equality of very 'unequal ' people in the format which, as you will remember, is quite rigid including, if you like, equality between the people who know why they are there and those who don’t. I just wondered if that experience had entered in any way into your calculations over this whole question you were wrestling with: the premise of culture being a central aspect of meaningfulness for all people – and how we bring that principle into our political formats? Ash: I agree with your point about the judder. We wanted to move away from the standard curated panel discussion in a static room with a Fordist block of an audience. We discussed doing away with the speakers altogether and asked ourselves if they performed a useful function. In the end we had a lot of speakers and they served a very useful purpose when you organise an event like that in the programme, because that list of names is all the audience has to go on when they decide to make the effort to attend… The room was packed. Also, if we are going to try to engage in discussions around policy, you do have to bring stakeholders into the mix, and you are curating politically to serve a wider purpose. The point you are making is that everyone is a stakeholder in the process we are trying to achieve. That’s true and we will have to get there. But we made a beginning. The plan we laid out initially, interestingly, would have been a lot more anarchic and chaotic. Facilitators posted at four corners of the room, where anyone could go and write things down and speakers would have to compete for attention with some of these. At the same time, you have a room full of people who are actually being encouraged just to meet one another for one minute, three minutes, five minute slots. I probably was influenced by that first market place of ideas session at the Team Syntegrity. Maybe I didn’t communicate the idea I hoped for well enough. It’s part of where we’re at, in this process of democratisation, that a lot of different kinds of people are interested in different models, with different ideas of what would be a disaster and what could work. It’s going to be an ongoing process for most of our lives isn’t it? TWT session in a packed room from where Rosemary was sitting.R: Yes – and a fascinating one to grapple with. Do you think the Labour Party is in a good place to advance these experiments about how to enable everybody and anybody to be more themselves in the process of change? Ash: I don’t see why not. I can see that what we are trying to do is a part of that conversation. I understand that there is a lot at stake, so there will be a lot of resistance. The question is how does it happen? Was it yesterday or today that we saw the launch of the Party Democracy Review? There is a generational effect going on. The new voice coming into politics from a lot of people under 40 like myself, shared a great antipathy towards New Labour but were solidly anti-Tory, didn’t agree with the war in Iraq, are anti-austerity and didn’t agree with the decades of privatisation of public services. That constituency has been voting tactically since 2001, and would probably have identified strongly with the green surge in 2015, but would be first and foremost committed to removing the Tories from government. The 2017 Labour Manifesto did reflect a lot of that politics. That wasn’t the case of the Labour Party in 2015. R: So where do you stand on the idea of a Progressive Alliance? Ash: I joined Compass at exactly the same time as I joined the Labour party and voted for Corbyn. The idea of a progressive alliance, a tactical coalition designed to end Tory rule for the foreseeable future, is basic common sense to me. But this election campaign was interesting. A kind of internal contest played out between the Corbyn leadership and the likes of Compass who were pushing the progressive alliance (which the Liberal Democrats also rejected). The Labour leadership won that contest. That was a surprise to me, but a happy surprise. If a Corbyn-led Labour party can form a government without the support of the Liberal Democrats then so much the better. But long term there is a bigger issue and one always needs to be open to the best way of reversing austerity, or nationalism, or xenophobia, or militarism or whatever it is, at any given time. In order to create the kind of society that we want to create in the 21st century, pluralism, I believe, sits at the heart of that. Democratic reform is an essential. The party democracy review is about internal democratic structures, but we are not going to change the way Britain functions until we take local democracy seriously and devolve power in a considered way to the regions. We urgently need to change our voting system. Once those shifts take place, the Labour Party is obviously going to have to learn how to work well with other parties. I have just moved from Hackney North to Totnes CLP where I recently attended my first meeting. It’s a really interesting seat – a safe Tory seat where Sarah Wollaston won comfortably in 2017, but Labour surprised everyone by taking second place for the first time in 47 years. The importance of the rural marginal is something Jeremy Corbyn makes interesting noises about. Totnes is the home of the decidedly non-partisan transition movement. It’s an interesting question whether the political energy of something like the transition movement can find any common ground with a local Labour Party? Should it? How do people best organise themselves to overturn a Toryism which has this country by the throat and has done for as long as I have been alive? That’s the question isn’t it? R: Is it essentially the same question – one of inclusive, pluralist political organisation? Ash: The event you attended was one of a series of three I put on as part of a team at TWT. The first, which we’ve talked about, was about shifting the broader debate on the nature of culture in a participatory format. The third one picked up on a lot of that discussion in a smaller room, with forty people, flipcharts, marker pens, a hothouse of ideas that are catalogued and will contribute towards a draft policy that reflects what came out of those TWT sessions. The middle session did something a bit different. It presented a more traditional panel of speakers. In many ways it broke all the rules we’ve been discussing. It put the artists on a pedestal. It harnessed the power of celebrity – with names like Ken Loach and Low-Key getting the audience queuing around the building. It played as less of a participatory experience than as a show to an audience that was seated and static. To paraphrase Hilary Wainwright, not participatory democracy exactly but a populist form which of course we’re seeing emerge all over the world on the left and the right. R: So why do it? Ash: Participation is a complicated idea. Jeremy Corbyn’s leadership is driving a lot of participation, a lot of active interest in the possibility of change. This year’s party conference was a real reflection of this. As part of what Jeremy Gilbert has called the age of ‘platform politics’, hopefully the coming years will see the emergence of this idea, of a movement-party, where high profile figures, commanding a lot of media space, can in turn help to bring people in and drive the movement forward and inspire new forms of participation. The idea of the social movement is inextricably linked with social media, isn’t it? It’s about profile and network, right? Ken Loach and Lowkey drew people in, sharing their power to help build a space where they and other artists were talking and sharing stories of political voice and that, in turn, moves through the audience and inspires participation which feeds back and creates new kinds of possibility. It was great to bring artists into the mix who are doing work that is political in really interesting ways but who the audience members might not have known about already – artists like the Director of Common Wealth, Rhiannon White, who I also met at Team Syntegrity. I managed to see Rhiannon’s play – We’re Still Here – which she put on in Port Talbot. It’s an amazing piece of theatre. The next day, at TWT, I met someone who had been at the event and it was Rhiannon she was asking about. She had come to see Ken Loach, and Ken was great, as were all the other speakers, but for that one woman it was Rhiannon she had taken away with her and whose political creativity she said would soon be reflected in her own work. Rhiannon, on the other hand, was talking to me about Ken Loach, and Barby Asante, and Low-Key, and then throwing herself into the mix at the Monday morning manifesto-writing session before making her way back up to Port Talbot to share the love and get back to her show. How can I put it? Participation seems to me like a kind of pyramid and it doesn’t really happen until the energy is moving around it and through it in all directions. What I found myself trying to do this summer, as an artist and a citizen, as an autonomous individual working with others who think the same way was, for a moment, to try to activate that whole pyramid, from the base to the apex, from the apex to the base and back again.